Work continues on the new Speedway in Portsmouth. Last week crews were putting the roof trusses on the new building. Construction has begun on the new Speedway located at 2401 Gallia Street in Portsmouth. According to Latisha Woods, communications supervisor with the company, the newly rebuilt store is expected to reopen at the end of June. The new 4,600 sq. ft. location will have eight auto dispensers, featuring auto/box truck diesel and flex fuel. Current plans for the store include Speedway’s latest evolution in food – a Speedy Café. Speedy Café is a fast casual restaurant where customers place their orders on a self-serve ordering kiosk. The food is freshly prepared and will feature paninis, subs, specialty dogs, customizable pizzas, hand-crafted beverages (lattes, mochas, smoothies and frappes), breakfast sandwiches and sides. This store will also feature a Beer Cave, as well as Speedy Rewards®, Speedway’s industry-leading loyalty program. Speedy Rewards provides customers with an opportunity to earn free merchandise and beverages, as well as the ability to accrue points on purchases that can be redeemed for merchandise and gift cards. Any customer can participate in Speedy Rewards and it is completely free. Speedway is the nation’s second largest company-owned and -operated convenience store chain with nearly 4,000 retail convenience stores across the United States. Headquartered in Enon, Speedway is a subsidiary of Marathon Petroleum Corporation. https://www.portsmouth-dailytimes.com/wp-content/uploads/sites/28/2019/04/web1_Speedway.jpgWork continues on the new Speedway in Portsmouth. 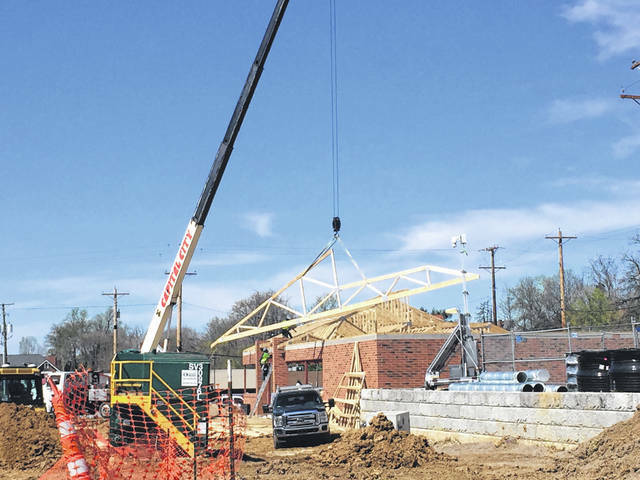 Last week crews were putting the roof trusses on the new building.